Oven cleaning | Hanson Oven Cleaning, Oven Cleaners - Macclesfield, Bollington, Prestbury, Cheadle, Cheadle Hulme, Marple, Hazel Grove, Stockport, Disley, Bramhall, Poynton, Wilmslow, Whaley Bridge, Bollington, Knutsford, Alderley Edge, Gawsworth, Holmes Chapel, Congleton and Sandbach. Why chose Hanson Oven Cleaning? Cleaning your oven yourself can be very time consuming and potentially dangerous if you don’t know what you’re doing. Don’t waste time and money and let Hanson Oven Cleaning do the hard work for you. The Hanson Oven Cleaning Company is a professional oven-cleaning specialist. 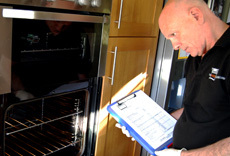 We clean all sizes of ovens, cookers, Ranges, hobs, extractor hoods and microwaves. At Hanson Oven Cleaning, we only use 100% non-caustic, environmentally friendly products in your home, ensuring a safe and fume-free environment. We have fully equipped, customised vehicles with specialist technology for removal of grease, fat and burnt on carbon. The result is a deep oven clean leaving your oven looking like new. Hanson Oven Cleaning is based in Macclesfield, Cheshire providing a professional, reliable and friendly oven cleaning service – covering all locations in or around the East Cheshire area. Locations include: Macclesfield, Cheadle, Cheadle Hulme, Marple, Hazel Grove, Disley, Bramhall, Poynton, Wilmslow, Whaley Bridge, Bollington, Knutsford, Bollington, Prestbury, Alderley Edge, Gawsworth, Holmes Chapel, Congleton and Sandbach.